Introduction: The first point to make is that it seems now widely agreed that liquid fire was, in fact, a petroleum-based weapon, and had no connection whatsoever with explosive materials or mixtures, whether suphur-, quicklime-, or saltpetre/gunpowder-based (as proposed, for example, by Berthelot in the late nineteenth century and by Zenghelis in the early 1930s, and followed by a number of more recent commentators, including Stratos). 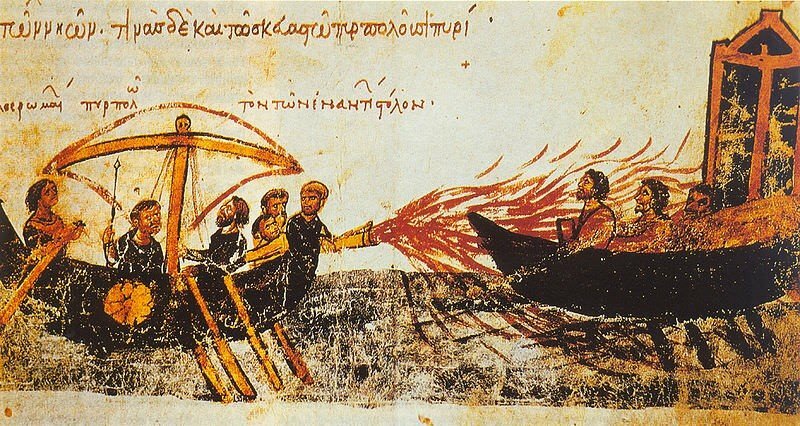 The last attempt to suggest that it was an explosive was by Paszthory in 1968, but his argument ignores some of the most important evidence, in particular the petroleum component, which was clearly crucial for the Byzantines. And there is not a shred of evidence to suggest that any form of gunpowder-based or explosive-based weapon was known or available to the western world before the arrival of gunpowder proper in the fourteenth century. The tenth-century De administrando imperio gives a list of major sources of supply of crude oil in the northern Pontic and Caucasus regions, for example. Most recently, the debate has been renewed with the appearance of a useful discussion by Th. Korres, entitled simply ‘Liquid fire’, which sets out the show that the real nature of ‘Greek fire’ was in fact a catapult-thrown projectile filled with combustible material, although he agrees that petroleum was the main ingredient. Before we look at this theory, therefore, let us briefly review the testimony of the sources.